The rise of the operating chair, and later, the operating table, began during the period when lithotomic procedures were prevalent in Europe. Lithotomy was the practice of removing bladder stones, which wasn’t considered a safe operation until the 20th century, but had to be done bladder stones were very painful and often deadly if left inside the body. In fact, from 1771-1773, at the Charité and Hôtel Dieu hospitals in Paris, anywhere from a third to a half of lithotomy patients died. 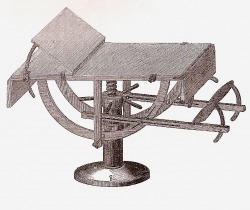 Since Lithotomies were considered one of the most common and dangerous operations of the 18th century, so surgical tables were developed for hospitals to aid in these procedures. These tables had adjustable backrests to hold the patient in a semi-vertical position and restrained his arms and hands. 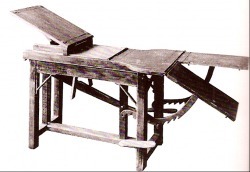 Lithotomy tables were one of the first specialized furniture developed for surgical purposes. From the 18th the 19th century, operating chairs were actually a little more common than operating tables, possibly because chairs were often used in bedchamber operations. Operating chairs provided surgeons with free access to the operating field, especially the neck, face, and upper limb areas. Operating chairs were also associated with operations done on “stronger patients” who could withstand lots of blood loss, since sitting upright led to an increased quantity of blood loss. Also, chairs were beneficial because they adequately restrained the patient, which was beneficial when patients lost consciousness. 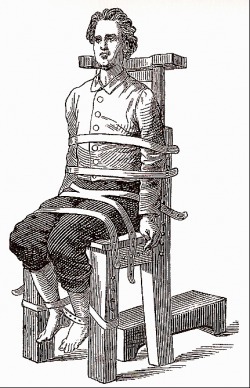 By the late 19th century, most operating chairs were wooden straight backs with numerous hooks to hold restraining straps. Chairs were also suspended off the ground so patients couldn’t push against the floor to brace themselves, which would cause movement. The first operating tables of the 19th century were more like long wooden benches supported by adjustable legs and backrest. There were also adjustable bars located at the foot of the table which acted as footrests, restraining straps, and a waterproof covering.